MorganStanleyGate: My Unlawful Extradition Must Be Stopped . . . Or I Will Be Assassinated ! Durham County in North Carolina is rife with corruption, such that the notion of justice there is a pipe-dream. I observed this municipal circus of illegitimacy with a ring-side seat in the Duke Men's Lacrosse Scandal, as my son Michael was on the team, and his best friend Collin Finnerty was one of the three wrongfully indicted players. 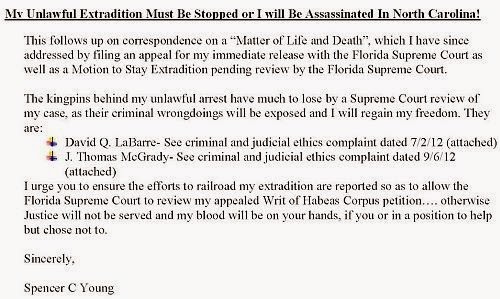 The plan is sadly commonplace and involves arranging "an accident" of some form (i.e., assassination) while incarcerated in North Carolina. And in light of the other assassination attempts, and I would much rather be prudently alarmist and alive than dismissive and dead.